A walker stands in silhouette in a rock arch on Cape Clear Island. 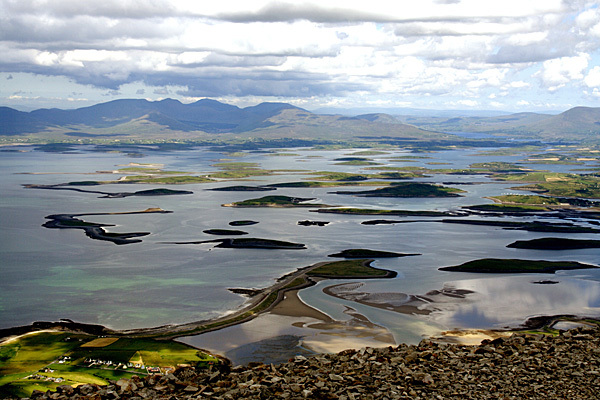 Clew Bay from Croagh Patrick, where they say there is an island for every day of the year! The rocky promontory of Dun Balair on Tory Island is a place of myth and legend. At first all the walks were going to be on the Irish mainland, but plans evolved to include several islands. The actual route research took four separate trips, stretching over eight months. In the end there were 54 walks, of which a third were on islands. Things weren't always plain sailing (excuse the pun) and involved heavy seas at times, walking in the teeth of a hurricane and being marooned an extra night on one island. Coastal walks always look pretty impressive with big breakers hurling themselves at the cliffs! 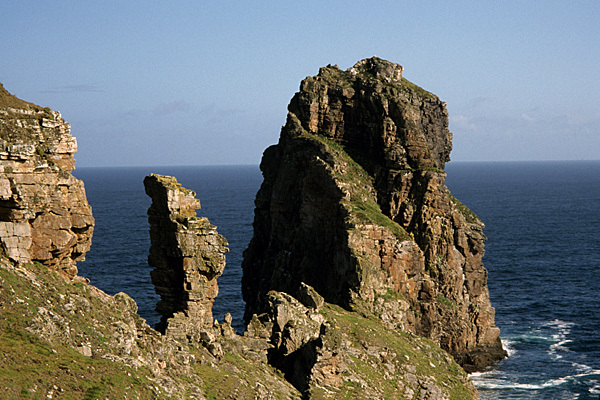 A variety of routes were checked from low-level beach walks and saltmarshes to towering and overhanging cliffs, including some of the highest sea cliffs in Europe. 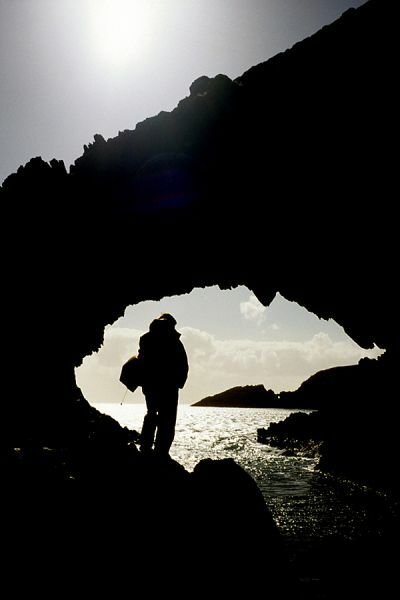 Ireland's coast is full of quirky features and the western seaboard is particularly attractive. Travelling around the coast was accomplished using Bus Eireann Rambler Tickets and Translink Freedom of Northern Ireland tickets, with Lough Swilly Buses used in Co Donegal. Travelling to the many islands involved using a remarkable variety of ferries in all kinds of weather conditions. In a review in Irish Mountain Log, Joss Lynam said, "The descriptions are clear and accurate, and there are good notes about places near the walks... good pics... interesting... enjoyable."